Yesterday, CCP Seagull and Team Size Matters announced a major change to the PLEX-Aurum relationship. Through a conversion process CCP plans to convert PLEX to what I am going to refer in this article as ‘Mini-PLEX’. CCP plans to convert one PLEX into 500 Mini-PLEX, with one month of game time being now worth 500 Mini-Plex. Additionally, it is their plan to convert Aurum into Mini-PLEX at the same rate PLEX is converted to Aurum, that being 7 Aurum to a Mini-Plex. In my opinion, this is a good change, streamlining the two currency systems into a single system hopefully will assist players engage with the New Eden Store. However, the devil is in the detail. At the same time, CCP stated that any account with an Aurum balance of less than 1000 Aurum would not be converted into Mini-PLEX, and will be removed from players accounts. If you are sitting on your 300 Aurum gift from CCP Games – you will get nothing. If you converted a PLEX, purchased some skins/services and have from 1 to 999 Aurum change – you will get nothing. If you have 1000 Aurum or more, It’s going to be fine, the Aurum on your account(s) will be converted into the new currency system. To make the comparisons I am going to benchmark a few values of items, both in terms of ingame currencies and real world currency. This is to avoid disagreements of semantics and prices. With this in mind, we can do some cheeky maths to cover some scenarios that players may find themselves in. Firstly looking at players who are sitting on their 300 Aurum Christmas gifts and secondly at players who have the maximum Aurum before the conversion will occur. Looking at the case of 300 Aurum: 300 AUR * 328,571 ISK = 98, 571, 300 ISK (98.57M ISK). I would consider this hardly a game breaking amount. In terms of in game items, it’s equivalent to a fitted Svipul and a can of Quafe Zero. To put it in comparison, the February 2017 economic report stated that in-game ISK faucets amounted to 103.402T ISK. Therefore to account for 1% of the period’s ISK faucets would require there to have been 1, 049, 007 (1.049M) active accounts receiving the 300 Aurum gift. For those who prefer see the gift converted to real world money, it is worth $US 1.71. This Aurum is also worth 8.57% of a PLEX based on the conversion ratios. Looking at the the more extreme case of having 999 Aurum, at the predetermined values previously stated, it is worth 328,242,858.57 ISK (328.24M ISK). The most likely method to have acquired this much Aurum is as change from converted PLEX after the purchase of skins and services, or the accumulation of gifts, prizes etc. An in-game approximation of the value would be approximately a faction fitted Phantasm, and, for consistency, is worth $US 5.69. The more likely scenario for having this much Aurum, is the remaining Aurum from a PLEX conversion that you have not spent yet. Using what can be seen from players as an arbitrary value of 1000 Aurum, CCP are planning on removing 28.54% of a PLEX that players that have worked for, bought, traded, stolen and saved. There are several recourses available to players moving forward into the future. A viable method of salvaging your lower value Aurum amounts is to get your account over the minimum conversion threshold. 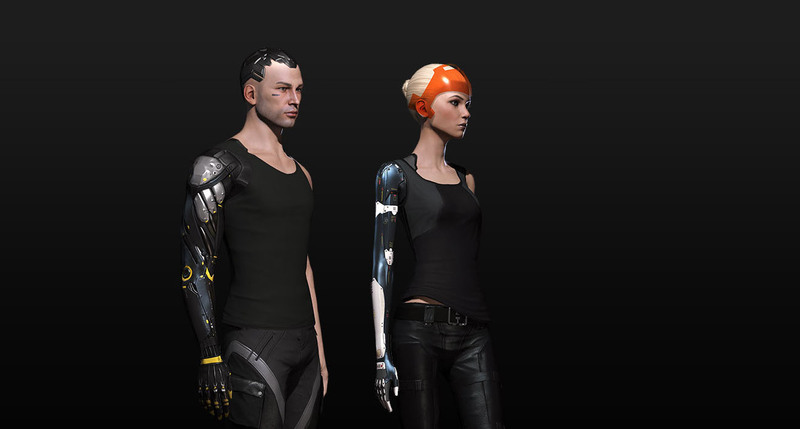 Additionally, CCP have also stated that items would be available on the New Eden Store to allow players to use their Aurum prior to the change. With the pre-patch conversion of 3500 Aurum per PLEX, in addition to your own Aurum (for this example using 999 Aurum), an account can acquire a balance of 4499 Aurum. When converted to the new system of Mini-PLEX it will yield a result of 642.71 Mini-PLEX, or by today’s standard, 1.29 PLEX (38.56 days game time). I am not saying that this method is not without risk or is by any means fool-proof. The best solution is that PLEX have been in the past the ‘Gold Brick’ of EVE Online, and most likely will continue to be after this change. One of the primary benefits will be the easy conversion of Aurum to game time after the patch has been deployed. I will add a caveat to the last paragraph. I understand that in this example, most, if not all of the Aurum was paid for through various means. It is an effect method of saving the Aurum balance that you had while only costing you one PLEX, maximising your return. With the ability to purchase items on the New Eden Store for this, in the under 1000 Aurum bracket, there is one glaring issue. The market is going to become oversaturated with items from 1 to 999 AUR, thus further decreasing the ISK value of the Aurum. Not to mention, I doubt that CCP will be devaluing top tier items and skins to accommodate the players in this predicament. If players see the merit in converting PLEX into Aurum, what you will find is there will continue to be a further spike in PLEX prices. 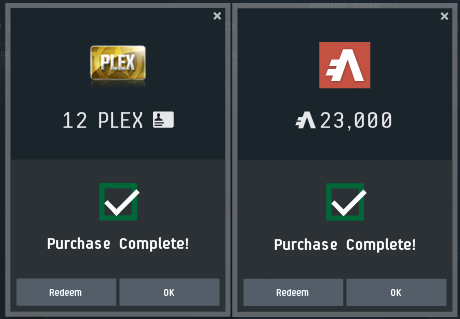 This sudden demand in PLEX will drive up the value of PLEX as people look to maximise the value of their Aurum, which in turn will drive PLEX sales for CCP prior to this change being rolled out on the server. Thus rewarding those who can afford either PLEX for ISK, or afford PLEX for RL money. As the ISK per $US increases in the player’s favour it will passively drive PLEX sales. This is also good for CCP, as the price of a PLEX is $US 19.95 in comparison to $US 14.95 for a regular real life money-based subscription. If CCP was concerned by the rapid increase of the in-game value of PLEX, they might consider a PLEX sale leading up to this. One of the big risks with doing this would be the over-saturation of the market and over-manipulation of PLEX economics, as the lowering of PLEX price would further distort the PLEX to $US ratio. So where does this leave the player base? Firstly, as we move forward towards the inevitable patch day, players will dive on any opportunity that looks to maximise their realisation of the Aurum on their accounts. What they will look like beyond getting your Aurum balances above the 1000 Aurum minimum will vary as the market moves to adapt and supply exceeds demand. The much more interesting question is, where does this leave CCP? A large section of the community appears to be concerned at the changes, especially the arbitrary point at which Aurum will be converted to the new system. What can be done? Firstly, as CCP has said numerous times, this conversion point is to avoid crashing the Mini-PLEX market after the changes have been made. However, I believe that they should look at converting all Aurum amounts below 1000 Aurum at a different rate to those above 1000. It wouldn’t be a perfect system, however, if CCP was to convert an account’s first 500 Aurum at 5 Aurum to a Mini-PLEX, then from 501 to 1000 Aurum at 6 Aurum per Mini-PLEX, This would mitigate the risk of crashing the Mini-PLEX market, while still honouring, at least partially, all Aurum balances of accounts. Secondly, CCP could avoid any further manipulation of the PLEX market. Publish the data on how many Mini-PLEX they expect to be generated in this process. Let the EVE economists and market PVP’ers speculate, as they do with almost every other major change, and let the chips fall as they may. To summarise, everyone who has Aurum on their accounts today has a value of 328,571.43 ISK per Aurum or $US 0.0057 per Aaurum. CCP is currently proposing that any amount under 1000 is literally worthless to them regardless of how the Aaurum was acquired. Everyone should look at the Aurum that they have and decide for themselves what they can spend their Aurum on. Focus on what is best for your style of play. If you value the gold brick PLEX standard of EVE and that is the way you want to hold on to the value of the Aurum under the new system, then investigate and calculate that approach. Look at other approaches to realise the ISK value of Aurum and pursue any opportunities that arise as CCP releases more details. Finally, make your voice heard, be that through your current CSM, or the future CSM, state your case with evidence. Give feedback through the forums, Reddit and Slack.